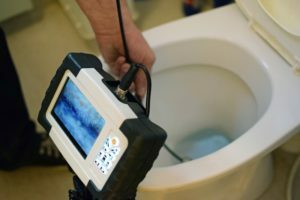 No matter how new and modern your home or office’s plumbing system might be, its proper function depends on its ability to direct water out of the building and into your city’s municipal sewer system or your own septic tank. There are many factors that can cause the main drain line to become clogged, risking the chance of unsanitary grey water backing up inside. Here are a few to keep in mind for purposes of prevention and, should trouble arise, remedy. It is a common fallacy that it’s OK to dump cooking grease down the kitchen sink, just so long as you run hot water at the same time. While the heat does significantly reduce the viscosity of the oil so that it flows quickly down the drain, the fats will cool off quickly and begin to harden and stick to the inside of your drain pipes. Eventually the main line between your house and the sewer may become so congested that normal effluvia such as toilet paper will no longer fit through, and you may face toilets, sinks and bathtubs backed up with waste water! Rather than release used grease into your plumbing system, pour it into a metal can or sturdy glass container and let it cool — then discard it with your trash. Better yet, drop it at your local recycler of cooking fats, who will refine your leftover grease into fuel which can be burned in any diesel vehicle in place of the traditional petroleum-based fuel. One might think that if any given object can be successfully flushed down the toilet, then it is OK to do so. This is absolutely not true! Literally the only things that should ever be flushed art human waste and toilet paper — the first of which the toilet was designed to accommodate, and the latter of which is engineered to disintegrate rapidly. Other paper goods, including paper towels and napkins, are not made in such a way and will quickly clog your sewer pipe. It is not uncommon, especially in older neighborhoods with clay sewer drain pipes, for tree roots to infiltrate these lines in search of the water inside. Over time these roots can grow so long and thick that they actively prevent waste water from flowing out of your house. There are some commercial root killers that can be put down your drain but while these may kill the roots, they may not actually remove them from the pipe. This is a good time to call your friendly neighborhood plumber to come do an inspection. They may wish to run a camera down the line and see if they can find the obstruction, and will be able to provide rooting services should they be necessary. Also note the location and routing of your sewer line when engaged in new building construction, and take care to refrain from planting trees or shrubs in close vicinity. This will help ensure root-free drainage for years to come. The most calamitous (and expensive) failure of sewer drain lines occurs when buried pipes become misshapen or broken. This can come about as a result of natural forces such as settling soil or earthquakes, or due to increased ground traffic or heavy vehicle/equipment usage. In the case of sagging, a segment of the pipe will sink lower than the rest, causing paper and waste to accumulate there, eventually slowing or blocking the flow of water exiting the house altogether. If the pipe breaks altogether you may not only face backups of waste water into the house but also contamination of the soil between your house and the city’s main sewer line or your septic tank. In either case, you will definitely need to call Comfort Systems, your professional plumbing service ASAP. They will quickly diagnose your problem and recommend a course of action. Generally this will mean digging up the old line and replacing it entirely, though in some cases, a localized repair may be possible. CALL COMFORT SYSTEMS AT 316-265-7831!